A youth football team walked off the pitch after one of their players was allegedly racially abused by a fan. Suffolk Football Association is investigating a claim from Ipswich Wanderers under-18s that their player was targeted at Framlingham Town U18. Manager Jonty Boon said the teenager had become distressed after hearing "a racial chant" from the crowd. When the matter was raised with the referee, the fan refused to leave, prompting Mr Boon to withdraw his team. "I'm not prepared at this level of football - or at any level of football - to have my player subject to that sort of abuse," he said. "The lad in question has quit football. He doesn't want to play football any more this season." The issue of racism in football was highlighted again this week when England players said they were targeted with abuse during a European Championships qualifier in Montenegro. Ipswich Wanderers under-18s said on Twitter that "coaching staff and players took the decision to leave the pitch following an incident believed to be racism from a fan within the ground directed at our player". The incident happened late in the second half of a Thurlow Nunn Youth League match on Thursday. Mr Boon said the referee had been told about the alleged chant, and a Framlingham Town coach had spoken to the fan. The fan denied the abuse but initially agreed to leave the ground, before taking his place again and refusing to leave, said Mr Boon. "Another coach went to speak to him and said he basically called my player a liar, and said he was over-reacting to banter," he added. Suffolk FA said it had begun an investigation but would not comment further. 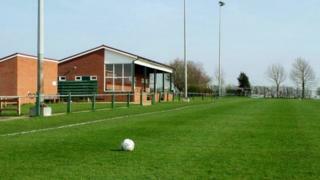 Framlingham Town FC has been approached for comment.